Parthenocissus is a genus of climbing plants from the grape family, Vitaceae. It contains about 12 species, from Asia and North America. Most are grown for ornamental use. The name is from Greek parthenos, "virgin", and kissos (Latinised as "cissus"), or in English "ivy". The reason is variously given as the ability of these creepers to form seeds without pollination, or the English name "Virginia creeper". 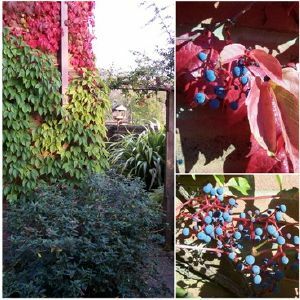 Parthenocissus himalayana var rubrifolia, as the name suggests, is from the Himalaya and is a self clinging, moderate to vigorous self supporting climber, which will grow to 10m given suitable support. The very attractive reddish purple leaves and young shoots turn a rich crimson in the autumn and the small highly fragrant flowers in late summer are a haven for honey bees, and are followed by attractive bright blue berries. Parthenocissus himalayana rubrifolia needs full sun and a warm, sheltered position. This variety is far less vigorous and smaller growing than the more commonlyavailable 'Boston Ivy' Parthenocissus tricuspidata or the 'VirginiaCreeper', Parthenocissus quinquefolia. The leaves turn colour much laterand are more persistant also, so the plant is better suited to smaller gardens. You can read my blog for further information. Parthenocissus himalayana rubrifolia needs full sun and a warm, sheltered position. Uses: A great plant for covering an unsightly wall or fence, or growing on outbuildings.